3 Birds now offers a trade-in valuation tool that is available for use in various types of email communications to owners and prospects. This brief paper introduces the tool and explains both how it organically integrates into media as well as what makes it a product of first impression in the marketplace. Furthermore, the results of this integration convincingly establish that, for owners and prospects, quickly and easily learning the current value of their vehicle creates a compelling reason to engage with dealers. ●Fully responsive and mobile-optimized. With nearly 60% of all email being opened and read on a mobile device, the importance of providing mobile-friendly tools simply cannot be overstated. ●Full transparency promotes consumer confidence. 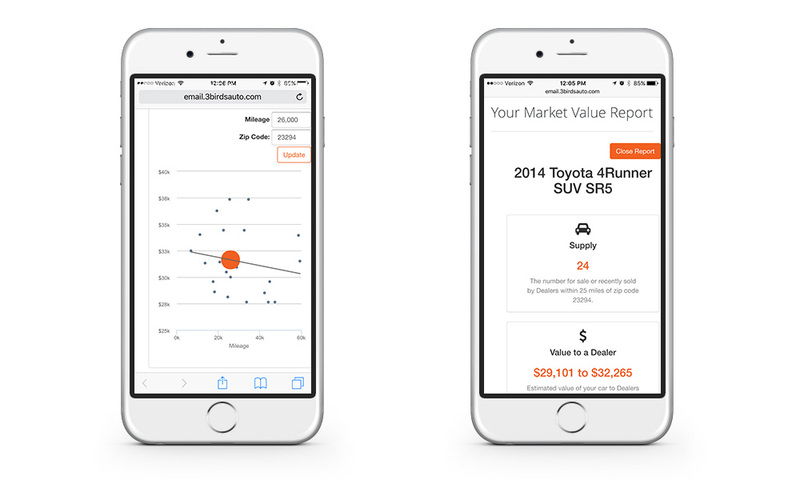 The tool extrapolates value based on similar cars currently for sale in the market. Customers are presented with the sales prices of similar vehicles in and around their zip code instead of a regional or national book value that does not account for local market conditions and supply issues. ●One click to convert. 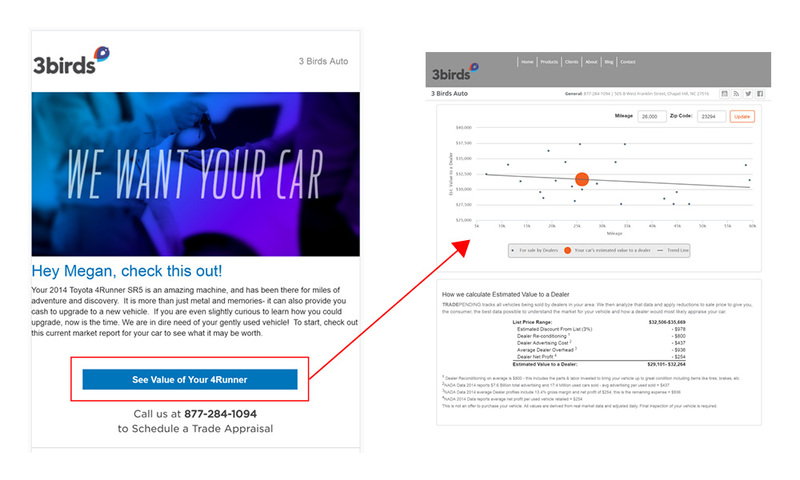 The tool requires just a single click by the customer to access the market report on their vehicle and initiate the lead process on the dealer’s side (think Amazon’s One-Click Ordering). Customers receive a market report without being forced to painstakingly re-enter information that the dealership has in its possession (name, email, phone number, make, model year, model, trim level, etc.) into another valuation tool that is often not mobile-optimized. The integration makes better use of existing data to reduce friction for consumers and results in a better experience for the shopper and better results for the dealership. ●Enhance customer data. The market report allows consumers to query the value of other vehicles in the household, leading to the collection of other valuable data concerning household vehicle ownership. ●Better user experience on the website. The trade-in valuation tool offers predictive type-ahead functionality, which leads to higher completion on the website and reduces form abandonment. This is not your father’s trade-in valuation tool. This tool levels up the consumer experience to approximate the digital experiences consumers have with other leading retailers outside of the automotive industry (such as ecommerce sites focused on clothing, furniture, home goods, books, etc.). Consumers expect to have a digital experience that is on par with the experience they have with other products when they are shopping for a vehicle, the second-biggest purchase most people make in their lifetime. 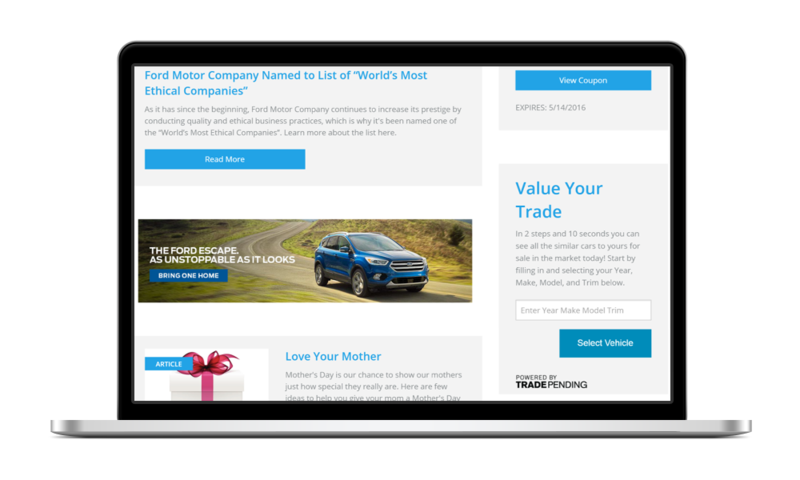 Providing your customers with a way to quickly learn the current value of their vehicle, instead of the same old “me too” branded valuation that customers likely have seen already on other sites, is a chance to distinguish your dealership from all of the noise. The tool can be integrated for use in a normal monthly “core” communication to the full dealership database (newsletter). 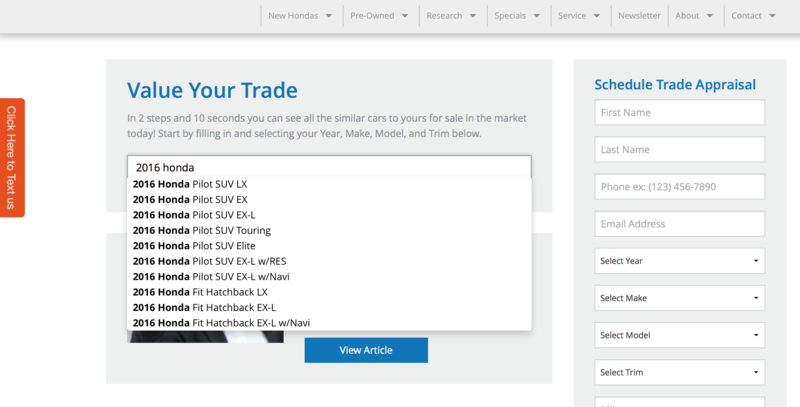 It can also be the centerpiece of a more targeted vehicle buyback campaign or it can accompany an inventory-based message, especially because the lead capture rate of the tool is unparalleled by other trade-value tools. Every click by a consumer to see the market report on their vehicle is an in-market lead for the dealership. The 3 Birds integrations of the tool are architected for every click to move shoppers closer to purchase or to collect valuable consumer intent data. Further, since market values change daily, it gives customers and prospects a reason to look forward to dealer communication each and every time. -Click-to-open conversion ratios as high as 23%. Nearly 1 in 4 people who open the email communications click to view a market report on their vehicle, thereby generating a lead for the dealership. -65% of the conversions came from consumers using smart phones or tablets. This underscores how critically important it is for any trade in application to be mobile optimized and designed to facilitate mobile conversions. -More than 21% of the customers and prospects who were presented with the lead opt-in form completed it and agreed to send their information to the dealer. -More than 2.5% of people who viewed the trade tool on the dealership website, ran a report to see their market value. Consumer online shopping behavior is changing. Form submissions on websites are down across the industry. The way dealers communicate with consumers must change as does what is considered a “lead” today. These market value reports are leads to dealers. Recognizing these market report conversions as leads, that pencils out to more than one in every three of the leads from our participating dealers’ sites coming from trade-in reports. Based on this data, the math to calculate the volume of anticipated lead responses is straightforward and easy. More than 60% of all automotive purchases involve the customer trading in another vehicle. As such, the majority of sales are influenced in part by the trade-in value of the vehicle the consumer is driving. The trade-in valuation tool has been integrated into 3 Birds communications. The data establishes that this integration is a powerful source of high-quality leads. Interested in learning more about it? Schedule a strategy session today.